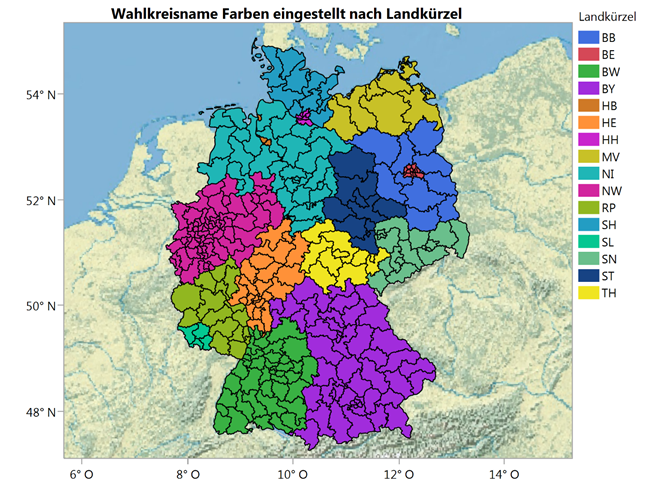 In preparation for the federal elections in Germany, the Federal Returning Officer has an interesting and important task: He needs to redraw the constituencies such that the number of constituencies in the individual Länder (states) corresponds as closely as possible to their share of the population. The population of a constituency must not deviate from the average population of all constituencies by more than 15% in either direction. The data and the borders of the constituencies are published on the Federal Returning Officer’s website. Let us use JMP to see how this requirement works out for the upcoming elections this weekend. The mean of constituents per unit is 208,000, and a 15% deviation up and down yields an interval from 177,000 to 240,000 (rounded). There are 59 constituencies that are out of these limits, but still within legally allowable limits. Some clustering of the distribution of the number of voters is seen around 195,000 and 215,000. Note that the number of constituencies representing the mean frequency of eligible voters is rather low. From the second distributions, we see that the most densely populated Bundesländer (having the most constituencies) are Nordrhein Westfalen – the area I come from – and Bayern (Bavaria). The latter has a higher share of out of spec constituencies than all other Bundesländer. 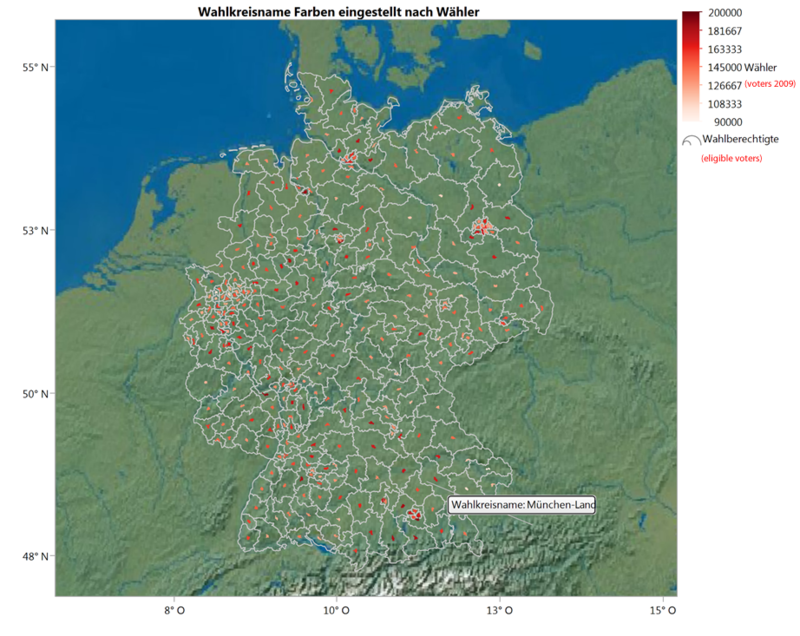 The geography of the constituencies can be imported into JMP and then be used in Graph Builder as background maps and reference objects for visualization. I did this for two variables. The number of eligible voters is represented as the area of the inner shape within each constituency. The color of the inner shape indicates the number of voters of the last federal election. The map shows small constituencies in areas with high population density and large ones in the rural areas. The area of the inner shapes corresponds to the number of eligible voters, our core measure. Ideally all shapes should have the identical area. Color depicts the actual voting behavior in the 2009 elections, the darker the higher. Pointing the mouse to one shape displays its name, and you can tag the label to any place on the map. Zooming into the area of Munich reveals clearly the differences between city and countryside. These can be found in rural and urban areas alike. The colors show that the actual voting behavior is quite different. It depends upon region: People in the southeast region seem to feel less well-represented by their politicians than people from southern parts. There is no evidence of a difference in behavior between urban and rural provinces. 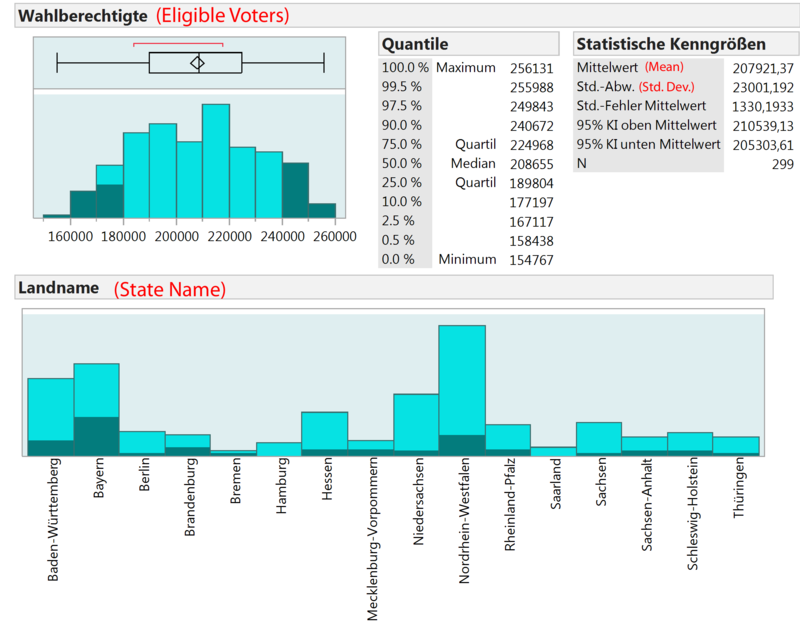 Looking closer at the shapes of the constituencies with respect to the borders of the Bundesländer (states), you see the effort needed to make them meet the requirement of containing the right number of voters and yet respecting the state borders. Socioeconomic data are also available from the website mentioned above that could be analyzed and visualized in just the same way. The Federal Returning Officer could tailor the constituencies to meet the conditions required by law. He has done his job. Now it’s up to the German people to do their job this weekend: Vote!